This entry was posted in Personal stories on 2017/03/01 by Susan. Chlorine helps sanitize swimming pools, but can be dangerous if handled improperly. Learn about the hazards of chlorine and how to protect yourself. 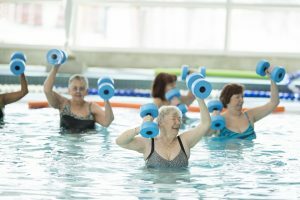 The big ceiling fans at the pool were blowing down during our warm-up for seniors’ aquafit, and one older lady was clearly not happy about the breeze. I was by far the youngest in the rowdy drop-in group, having joined on a dare from my friend. Usually we swam laps, but — just for fun — I took the dare and gave it a try. Ah, chlorine! This awesome chemical — along with other processes using ozone and ultra-violet light — allows us to safely share the same water for swimming and hot tubbing. We sometimes call it “human soup” when the hot tub is really full, but it’s comforting to know that chlorine is killing bacteria and other pathogens. However, it can be very dangerous, so workers must handle it with care. Preventing chlorine gas exposure at municipal pools is a new bulletin from WorkSafeBC that describes how chlorine can put workers and the public at serious risk. The bulletin outlines how to prevent leaks during delivery, daily operations, and cylinder replacements. I took a look at some WorkSafeBC incident summaries (type “chlorine” in the search bar) and read how chlorine exposure also affects workers in other industries, like manufacturing and construction. Workers who were exposed to chlorine suffered “respiratory distress,” along with lung, eye, and upper respiratory irritations and lots of other problems. See more info in Chlorine exposure during storage or use. So, as much as the fans were getting on my aquafit buddy’s nerves, we could not have the damned things shut off. *Note: The instructor may have been referring to chloramines, the chemical by-products that form when chlorine and sources of nitrogen such as ammonia, urine, and sweat react in water. You can learn more in the WorkSafeBC book Chloramines: Safe Work Practices.